I recently attended an event in a local Houston hotel. The hotel had been remodeled in a modern design recently. Everything looked great, but I was surprised to walk into the women's restroom to discover mirrors above the sinks that distorted images. 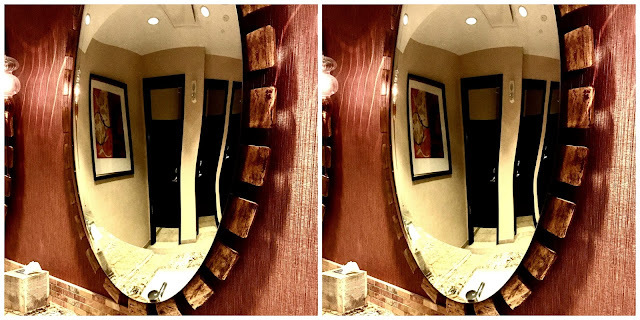 Do you notice anything unusual about the reflection in these mirrors? My iPhone photo is not the best, but I hope you can see why those mirrors reminded me of the carnival fun house mirrors - look one direction and you are short and wide - look another and you are super tall and stick like - look a different direction and you are wavy. Anyone with a sense of humor had to laugh at the poor selection in mirror design for the women's restroom. But for me, and many other women, those mirrors are a reminder of the negative reflections we fight every day. In high school I read about the perfect hour glass figure and I worked so hard to get close to the 36”-24”-36” (the 24" waist was the hardest part to achieve in that formula, and the number I wanted to obtain, even if it was only briefly). My Freshman year of college I gained the “Freshman 15” AND I packed on an additional 20 pounds for a total of 35 new pounds and clothing that was at least 3-4 dress sizes larger than when I started the previous fall. My face was as round as a basketball. I struggled for at least 2 years to get the weight to come off. I dieted. I exercised. I tried everything I read about (that was before everyone had access to the Internet). It seemed the harder I tried to lose the weight, the more it clung to me. Honestly, I still struggle with my reflection in the mirror. Even though US women’s clothing sizes say I’m a certain size on the label, I swear that label should be a few sizes larger. People have told me I am thin, but my mirror's reflection taunts me with the images from the past. And my mirror battles don’t stop at dress sizes. I had terrible acne as a teen (I am so very thankful for makeup). I don't let a morning go by without wearing makeup - I know it's my profession, but it's also an insecurity thanks to my acne days. To this day, I spend lots of time after my nightly cleansing routine, checking for blemishes. While I don’t find as much to poke on anymore, I can't help but note the development of discoloration and fine lines. And then there a bad hair days (compliments of Houston’s extremely humid climate). And then there are the wisdom hairs. I do have pure joy in knowing who I belong to and who created me and that gives me a peace that trumps even the most distorted mirror reflection. The knowledge that God "knitted me together in my mother's womb" (Psalm 139:13) and created me to be the woman I am, allows me to step away from the mirror and greet the world with a confidence that is a divine gift. If you struggle with self-doubt and negative self-image, don't try to force yourself into a mold you think the world wants to see because you will never be able to measure up to the constantly changing expections. The love and peace of Christ never changes and realizing you were created in His image, and for His purpose, is the beautiful story called "Amazing Grace". It's my story and it can be your story too. In a world that focuses so much on outward beauty and perfection, it's hard sometime to remember what's truly important. Thank you for your encouragement and reminder that we should only about how God sees us and not man. Thank you for stopping by Hurried Hostess!